There was a time when UX was all about delicate and intuitive design. But as we dive deeper into it, we discover more and more factors affecting the user’s experience with a product. It’s far more than beautiful interface now. The scope of UX gradually expands covering such aspects as web content and formatting, marketing messages and CTAs, customer service, as well as the overall value of a product. So when we speak about good UX, we imagine a satisfied and happy user… whatever it takes. And how do we make users happy? By solving their problems in the best possible way. One of these ways is user onboarding. 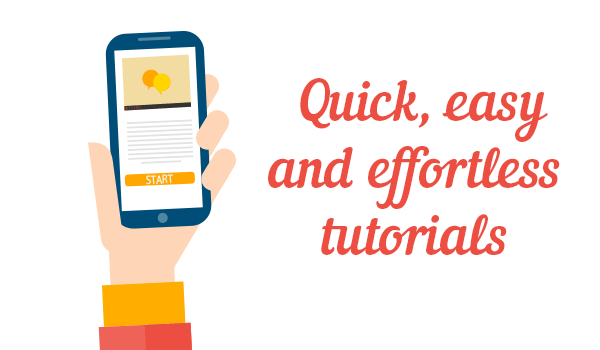 User onboarding is a set of activities to help turn first time visitors into active users. It is an ongoing process and not a feature that you can introduce once and then forget about it. It’s basically the first experience with a product which turns out to be so great that you want to use it again. So good user onboarding flow is not limited to some intuitive interface and cute walkthroughs, cause that’s not what solves the user’s problem. You need to deliver value and show your worth as early in the process as you can. With so many apps out there for practically any task you might think of, your app needs to stand out right from the very first launch. 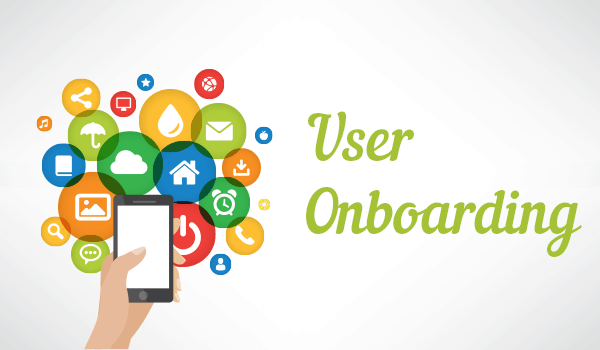 User onboarding should ideally bring the first time user to that magical a-ha! moment when he realizes “this app is exactly what I need”. How to Design Good User Onboarding Flow for Mobile Apps? First of all let’s agree that user the onboarding process varies depending on product type. For instance if you are designing onboarding experience for a SaaS, it’s completely different from what you would create for a mobile app. You have to always keep in mind who you design for and what goals you are trying to accomplish with user onboarding. 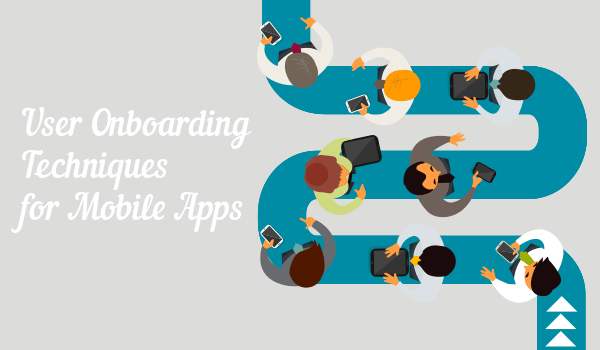 But let’s now focus on mobile app onboarding. What is it that makes some users stick with an app while others open it once and then delete it? Well, obviously you can’t serve everyone’s needs but if a user downloads the app and then leaves, it means your app wasn’t convincing enough. So as a starting point for your user onboarding research you can do a few contextual interviews with successful users to understand what exactly they love about the app, how it solves their problems and what more they expect from it. 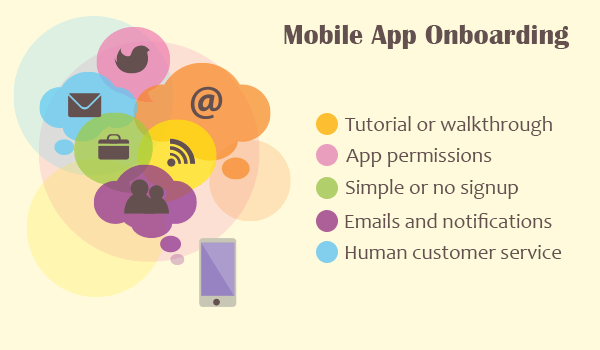 Ideally user onboarding will help the first time visitor experience the best of your app as soon as possible thus turning him into an active user. Easier said than done, but there are a few proven techniques that can help you design great onboarding flow for a mobile app. While some publications consider walkthroughs the same as user onboarding, I personally think it’s a vital part of onboarding but certainly not the same thing. A tutorial is a nice way to greet the user but you should be careful not to annoy him by teaching things he already knows. So if there’s anything in the app interface or features that might confuse the user, it’s definitely worth doing a quick walkthrough. However try to make it quick, easy and effortless. It’s all about showing how exactly the app is going to make the user’s life better. The story should be about the product and not about the interface, no matter how proud it makes you feel. This is a very tricky part in the onboarding process, because asking permissions at the wrong time and place may ruin the user experience and annoy the user to the point of deleting the app altogether. But if iOS users at least have the right to give this or that permission to an app, poor Android users won’t have that privilege until the official release of Android M. Anyway, it is very important not to ask for something you don’t really need to provide the service. But even if your app really needs access to certain information on user’s device, make sure to give something to the user first before asking for permissions. It’s the simple reciprocity rule (best described by Robert Cialdini in his book “Influence”). First provide something of value for the user and then only ask something “in return”. Let them use the product straight away and ask permissions only when the app cannot technically operate without them. To highlight the importance of having no registration forms just ask yourself how much spare time do you have and how much do you enjoy filling out lengthy registration forms? Not much, I believe. So ideally a good mobile app onboarding is the one without a signup. However if you do have a registration form, you can still minimize the pain. Do your best to make it as short and comprehensive as possible. Ask very little upfront and try to save user’s time by implementing smart defaults, inline validation, completion status bar or any other usability hacks that work for your app. Now when you have made a great first impression, it’s time to retain your precious users. At this point you can go ahead and use email (if you have previously gathered that information) or push notifications to remind the users about the app. But remember not to be too intrusive. Make sure the alerts and notifications really have value for the user. You can also run email drip campaigns, which are basically pre written emails that are sent to new users with predefined intervals, say on day 1, day 3 and day 7. With the help of these emails you can guide the users through the app, introduce new features and inspire them to get the most out of the app. Take for example Steller, a social networking app where users create and share visual stories. Steller sends daily “story of the day” emails featuring the most popular stories thus gently nudging users to create new stories themselves or at least browse existing collections. It’s always reassuring to know that there are real people behind a product, people who are always ready to help with any issue or question with the app. Caring for your users and making them happy should be your top priority, at least users need to feel that it is. Creating and maintaining good relationships with users is a vital part of onboarding. None of your marketing efforts will speak louder than satisfied users. So make sure to have a well-trained and empathetic customer support team. So as you see, good user onboarding requires commitment and a whole lot of effort on daily basis. You need to put these onboarding techniques at the foundation of your app marketing strategy, but above all these you need to provide value to the user no matter what you do. Only then you will have a sound product strategy and hopefully your own brand evangelists. 1000s have recommended us, sign up today for free. Stay up to date with prototyping tools and design news. Become an author and share your expertise.